I got a few things at Wegmans yesterday to tide us over until our next monthly grocery shopping trip. The lines were long for some reason, so I decided to read some headlines on the magazines at the checkouts. Of course, I was immediately reminded of the High School Skinny post I did a long time ago. 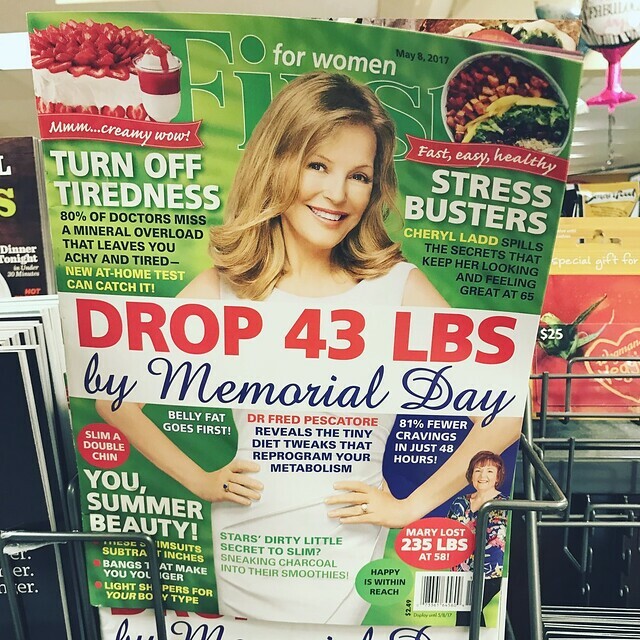 Drop 43 pounds by Memorial Day? The date on the magazine says May 3. Belly fat goes first? I didn't think you could target weight-loss. 81 percent fewer cravings in just 48 hours? How was that determined? Reprogram your metabolism. Uh, huh. You know, just randomly thrown in. First off, how can anyone, save Biggest Loser contestants (and you know how I feel about that show! ), lose 43 pounds in a month? Second, I totally see how this appeals to people. There's so much promise on this page. It makes life seem so simple. Your weight is keeping you down. Making you sad. Making you feel ugly inside and out. See those beautiful movie stars? Well, they sneak charcoal into their smoothies. If you do X, Y, and Z . . . not only will you lose weight, you'll lose LOTS of it and FAST. Only, I'm sure nobody gets enough close to reaching what these things promise. It got me thinking: How are these publications still on the shelves? Who is buying this crap? My first exposure to these crash and fad diet magazines was in high school when my boyfriend's mother tried the cabbage soup diet. That was nearly 20 years ago, and I know they've been around longer than that. So many thoughts. All the thoughts. Which brings me to an update on my own weight. I am "stuck" at 145 pounds. No matter what I do. Weight Watchers certainly helped me clean up my act nutritionally, and I thank it for that. But I've decided not to continue my membership for the time being. There's more going on besides what I eat. I am almost certain I won't lose any more until I wean, and that's cool with me, albeit somewhat annoying. In the meantime, I'm staying active. Wearing my Garmin VivoSmart, and it's working out great. I got 14,000 steps yesterday. I always go back and forth on wearing it all day, and then I realize when I wear it that I truly do feel more motivated to take a quickie walk or just do something to get my body in motion. I may not lose 43 pounds this month (what a weirdly specific number, no?) . . . but that's not what health and, yeah, HAPPINESS is about. I will admit that I probably think about these matters more than I'd like. But even I understand that happiness isn't achieved in reaching a number on the scale. That's so much deeper. And shame on people who put out a message that says otherwise -- and profit from it, no less.